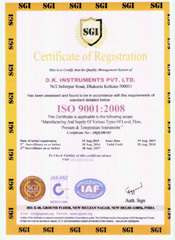 D. K. Instruments Pvt. Ltd., pioneer with Reed Switch concept will differentiate itself from other instrument manufacturers by providing the highest level of expertise to our customers. The process instrumentation we suggest will be the best possible solution for your application, or we will not sell it. "We will be characterized by providing uncompromising quality, service and delivery to our customers. To demonstrate our dedication to and understanding of the process industry by designing, developing and manufacturing the highest-quality, most reliable ...."
Quality, service and delivery are the foundation of DK’s service to the process industry since incorporation. For us, quality means reliability. It means designing, developing and manufacturing the safest, most robust ..